Lurking on the Gig Rig / Vintage & Rare Guitars stand at the London Music Show (Ooh La La Synth Mangler FTW!) 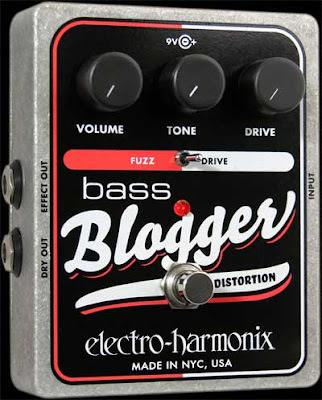 was this - Electro Harmonix' brand-new Bass Blogger pedal. If you're thinking 'ick, crappy name', then it only gets worse. It's described on the EHX site as "Ultra subtle and perfect distortion creates the perfect dialog with your drummer." Geddit? It's like you're blogging to your drummer! Sending him irregular and poorly spelt updates about your latest, er, notes. In return, he can let you know that, actually, your notes would be better if you'd played them on a Mac. 2/10, Mr Harmonix. Must try harder. Is that really any worse than the old EHX "Bass Balls"? Or hell, the Big Muff Pi? Seriously. I LOL'd. Great post. Bass-Blogger is a "ick, crappy name"?